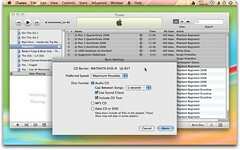 If you use iTunes to burn audio CDs from your playlists, you might have been bitten by this problem: you burn the CD to later find that there is no "CD Text" indication of what the song or band is, despite your player's supporting the display of such text. Just a whole pile of "unknown artists". Next time you burn, select your playlist or songs, click "Burn Disc" from the lower right in iTunes, and when the Burn Settings popup window appears, be sure to select "Include CD Text". This, and "Use Sound Check" are not selected by default. Select them, and you are good to go. If you rip or ingest a CD into iTunes, this CD Text will show up in the first place if you have an active Internet connection, and iTunes was able to access the CDDB "Gracenote" database of artist, album and song titles. By the way, I'm using iTunes 8.0.2 on the latest Mac OS X, so your mileage may vary. You can also use Toast Titanium to copy a CD you own directly, and include the CD Text so that when you play the CD in your car, the song titles show up.